WW1 British Soldier Grey Shirt. W.L.A. Short Sleeved Top. Dungarees, jumper, armband, badge, tie, hat, socks, belt and breeches. The black and white photo is an original 1940's photograph and the last photo is a close up of a 1942 issue top. Modern V neck machine knitted jumper. This fine knitted jumper is made from cotton and acrylic and is wonderfully soft and comfortable to wear. Machine wash at 40 degrees. Size 3: 38" - 40" chest. It was worn during WW2 as part of the WLA uniform. This armband has been made by us here in the UK not mass produced overseas. Dungarees, jumper, armband, badge, tie, hat, socks, belt and breeches. Dark green tie woven with the WLA initials in gold and red. This is a reproduction based on an original tie in our collection. Whilst I cannot give an exact age I would suggest that these probably date from the WW2 era through to the 1960's?. It would appear that they would have secured to the nurses dress using pins or buttons which are not included. These are the best modern sock that we can find anywhere to represent the WLA socks, we are sure that you will be happy with them! Dungarees, short sleeve top, jumper, armband, badge, tie, socks, belt, breeches and more. Superb grenade prop with sound. US ARMY WW2 PINEAPPLE GRENADE FANCY DRESS PROP - NEW. These dungarees are made from British produced cotton drill and are in a sandy tan colour. 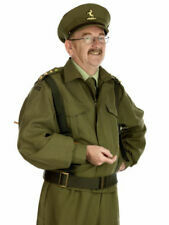 We make them to be as close as possible to the original 1940's Uniform but with the convenience of modern sizes. WLA UNIFORM BADGE. Dungarees, jumper, armband, badge, tie, hat, socks, belt and breeches. The reproduction process has not produced a 100% clear image. RED POPPY HEADSCARF SET. 100% cotton headscarf with a colourful print of red poppies on a navy background. With clear pictures it takes the mystery out of scarf wearing. This is a great way to cover a modern hairstyle (or colour!). Dungarees, short sleeve top, jumper, armband, badge, tie, hat, socks, belt and breeches. This jacket is made from British produced cotton drill and are in a sandy tan colour. 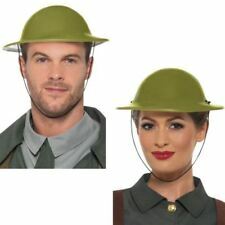 It is made as close as possible to the original 1940's Uniform but with the convenience of modern sizes. SKIRT IS COMPRISED OF 10 PANELS TO GIVE A FULLNESS. LENGTH 42" (APPROX). HAND SEWN BY MYSELF. This a reproduction WW1 Hosptial blue jacket tunic. Great for community projects, theatre, short films and museums. Blue fabric with white cotton lining.